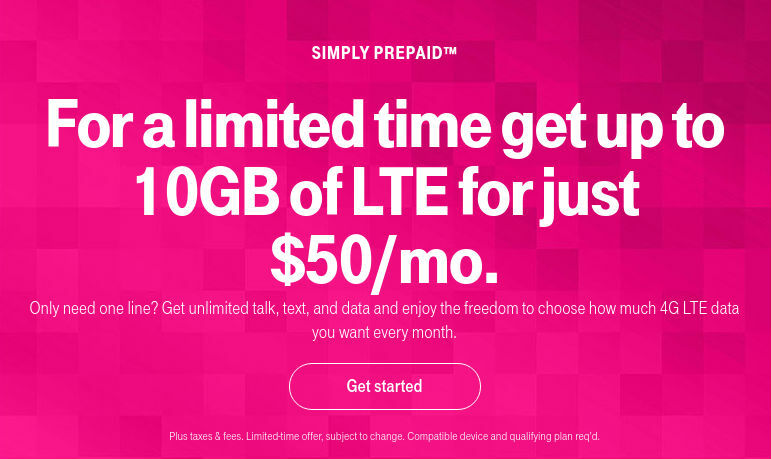 T-Mobile is currently offering a new $50 Simply Prepaid plan that includes unlimited voice, messaging and data with the first 10 GB of data at high speed. That's a better deal than T-Mobile's regular Simply Prepaid plans which come with 4 GB of high speed data for $45 or 6 GB for $55. 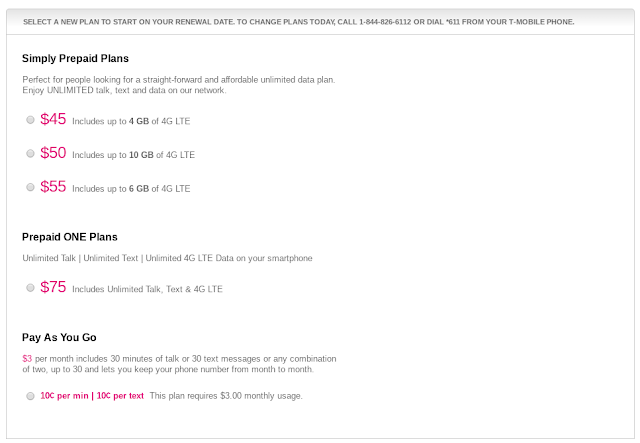 The T-Mobile site says that the $50 plan is a limited time offer with no indication of how long it's available for. Unlike some other operators, T-Mobile has always been good about grandfathering its plans, so when this promotion ends I expect customers who are on the plan will be able to keep their 10 GB. 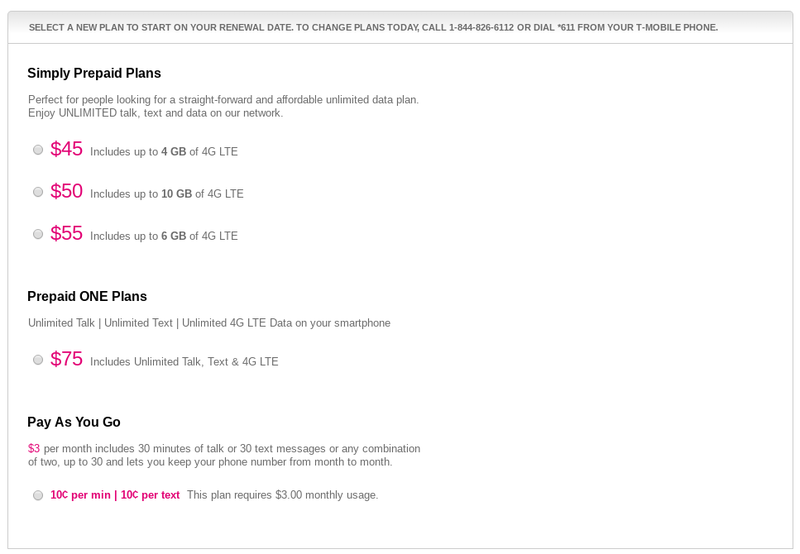 The new plan is available online to both new and current customers, as it shows up as an available plan that I could switch to on my My T-Mobile OLAM dashboard (image below). 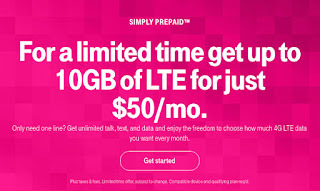 According to the fine print on the T-Mobile Prepaid site the $50 plan has the same perks and limitations as the other Simply Prepaid plans. That means that includes unlimited music streaming that doesn't count against your data cap, hotspot privileges, unlimited domestic voice and text roaming, 100 MB of data roaming and Data Maximizer, which throttles video to 1.5 mbps. Data Maximizer can be turned off if you's prefer HD video at the expense of greater data consumption. Calling and texting to and roaming in Canada and Mexico can be added for $5 per month, Unlimited international calling and texting can be added for $15 per month. But why would you do that when MetroPCS offers unlimited for 60.00? That is clearly the better deal. Metro is arguably a "lower" tier of product, from a positioning standpoint. If you don't use more than 10GB then why pay more for something you don't use? Looks like Metro gives you unlimited for $50.. But no hotspot. Because 10gb is more than enough especially with music freedom. So BingeOn is not offered anymore? I have the $30 plan that's no longer available and Binge On works on that plan. That has been the best value I've ever gotten. JSantana, which component(s) of Binge One are working on this plan: the throttling or the whitelisting? ... because you'd rather spend less money than more? Video streams at 480p with Binge On and it doesn't count against the high speed data allotment. I've used YouTube and Netflix and I noticed that it doesn't count against my data since it streams at standard DVD quality.I tried the simply prepaid plan and data maximizer still counts. One more thing I forgot to mention is that music freedom was also available on the $30 plan. Metro already has both a $30/2GB plan and a $50 unlimited data plan. I believe anon535 was referring to the T-Mobile $30/5GB plan (w/ Music Freedom whitelisting.) That is still very competitive. 100 minutes is only competitive if you're always around a landline. "100 minutes is only competitive if you're always around a landline." I once had a 60 minute plan, and I only went over it some of the time. "you seem to be interested in more minutes over data"
I don't want MORE minutes than megabytes, or even anywhere near as much. I just want enough that I won't hit overages if I'm not on a 1 or 2 cent paygo plan. That's why I'm switching to US Mobile next month, which will shave about $8 off compared to my GoPhone bill. They also happen to offer a 100/Unl/4GB plan for $32 that's just about the same as Tmo's $30/5GB plan, except without the data throttling or increasingly niche Tuesday perks. My wife and I are still on the old $30/5GB plan and somehow we get Binge On (no music freedom though). T-Mo works great everywhere we go and at that price point for what effectively feels like a totally unlimited everything plan for each of us... Not planning to switch to anything else anytime soon. Are your sure you're not getting music freedom? I have the same plan and yes Netflix for instance doesn't use my data bucket.